Will the GL of Minnesota Shun West Virginia Over PGM Haas? News is slowly trickling out about the annual communications of the Grand Lodge of Minnesota yesterday and today. Both the Millenniel Mason blog's Twitter feed, as well as a posting by Philalethes Society editor Nelson King are implying that the GL of Minnesota is investigating the notion of withdrawing recognition of the Grand Lodge of West Virginia over WV's suspension of MWBro. Frank Haas, PGM, and its rescinding of the so-called Wheeling Reforms. The civil case brought by Haas against the Grand Lodge of West Virginia has reportedly cost the GL on the order of $100,000 so far, which has included their hiring of a private investigator. I honestly wish both sides would blink on this and get back to the work of making Freemasonry in West Virginia the very best it can be. Nothing good can come from this continued standoff. I have looked at the different messages throughout the Internet, and I would like to clear up some miscommunications about the motion (which carried) concerning the Grand Lodge of West Virginia. The motion does not revoke recognition immediately nor even at the next Communication. The motion charges the External Relations committee to look into the regularity of the Masonic practices of the Grand Lodge of West Virginia and to report its findings to the Craft next year. At that time, it is possible that the Grand Lodge will vote on withdrawing recognition of the Grand Lodge of West Virginia. Therefore be it resolved that the Grand Lodge of Minnesota expresses its concern over these actions and wil consider suspending recognition of the Grand Lodge of West Virginia upon the recommendation of our External Relations Committee at our next Annual Communication in 2010 if there is not correction of these actions and a renewed willingness by the Grand Lodge of West Virginia to enter into the modern fraternity of Freemasonry. A book that regularly shows up in the top of Amazon's Freemasonry list is Masonic Enlightenment - The Philosophy, History and Wisdom of Freemasonry, edited by Brother Mike Poll. Mike is one of the unsung heroes of Masonic education in the US, as a publisher of dozens of titles of interest to the Craft. His Cornerstone Book Publishers is a labor of love, because no one gets rich in the Masonic publishing business. Much of Cornerstone's list is made up of reprints of long out of print classics and Masonic authors from the past. But Mike publishes new authors as well. In fact, two new books likely would have had a tough time getting published without Mike. It is a book I thought would never see print. Masonic publishers did not want to touch it, afraid to publish something that suggested Freemasons might be guilty of murder, and non-Masonic publishers were reluctant to touch it for fear of alienating the Freemasons who might buy their books. Look for it before summer. Many Internet Masons are familiar with Karen Kidd (Imakegarb) from several Masonic forums. Karen is a member of an American female observance Masonic lodge, and was a winner of Britain's Internet Lodge No. 9659 short essay contest, sponsored by the United Grand Lodge of England's former Pro-Grand Master, Lord Northampton last year. Cornerstone will soon be publishing Karen's new book, Haunted Chambers: the Lives of Early Women Freemasons. "Haunted Chambers", for the first time ever, presents not only the most complete list of early women Freemasons but also as much detail about their lives as can still be found. Here are their stories, long suppressed, ignored and marginalized. They include medieval women stone cutters; so-called "adoptive" women Freemasons; an aritocrat; a countess; an early New Brunswick settler; a war hero; a writer of women rights; an immigrant Irish girl; the famed sculptress of Abraham Lincoln's statue in the US Capitol Rotundra and many whose names are now lost. Some will find this book a challenge. Some would rather it never had been written, let alone published. "Haunted Chambers" is highly recommended to anyone who wants the actual history of these early women Freemasons and aren't afraid to read it. Lewis Masonic has a proud history of publishing books for Freemasons in Britain for decades, and they have a massive catalogue of titles. Unfortunately, US Freemasons rarely find out about them. Virtually no Masonic magazines in the US accept advertising (The Journal of the Masonic Society and the Knight Templar Magazine are about the only two), they have no distribution in US bookstores, and their presence on Amazon.com can be spotty. As easy as it is to order online, their UK website was off-putting to Americans who scratched their heads figuring the exchange rate and balking at shipping charges. At long last, the company's extensive list is available with US prices, and shipping from a US distributor. Some of their more popular authors include Yasha Beresiner, Harry Carr, Stephen Dafoe, Robert Lomas, Reverend Neville Barker Cryer, Tobias Churton, and many more. Excuse the intrusion of crass economics, but March is officially "Dummies Month," and there are just a couple of days left. Buy one or two Dummies books on any subject (not just ours) before March 31st, 2009, and get $5 direct from the publisher. In addition, the Wiley folks will also send along another $5 mail-in rebate form for any Dummies book purchased in June, July or August 2009. Obviously, we like you to take this opportunity to scoop up our books: Freemasons For Dummies, The Templar Code For Dummies, and Conspiracy Theories & Secret Societies For Dummies. But there are more than 1,300 Dummies titles out there, and they are all part of this offer. You can download a pdf of the rebate form here. Two years ago, the Masonic Information Center created the Mark Twain Award, to "recognize Lodge leadership for asserting a uniquely Masonic identity both within the Lodge and throughout the community that is consistent with the Fraternity's historic focus on education, self-improvement, good works, and fellowship." It's the only national Masonic award of its kind, and it represents achievement at the local lodge level. Lodges that win the Twain award are working hard to make their individual lodge just that—individual. These lodges have found ways to make their lodge unique, distinctive, educational, vital to their members, and a part of the community in which they reside. Masonic Bling: "The Master's Jewel"
A belated note of thanks and admiration for the artistry of Brother Andrew Horn at The Master's Jewel. 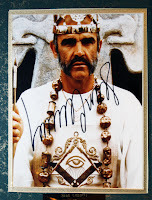 I have long admired his reproduction of the jewel worn by Sean Connery in The Man Who Would be King, and Alice made me a gift of this beautiful piece back in January. I had the opportunity to meet Drew in San Francisco in 2007 at the Grand Lodge of California's annual meeting. 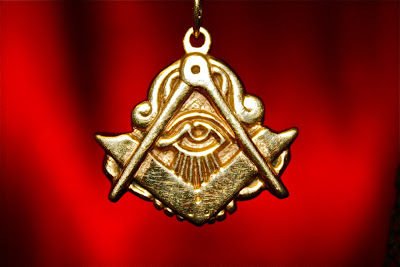 He does beautiful work that's unlike any other Masonic jewelry you'll find. Drew is also the operator of the Masonic Ink website, dedicated to the growing universe of Masonic tattoos. If you've never read Brother Rudyard Kipling's story The Man Who Would be King, go and read it. Or at least see the incredible movie directed by John Houston, starring Sean Connery and Michael Caine, with Christopher Plummer as Kipling. Either way, if you don't bawl like a little girl at the end, you have no heart. The Denver Consistory of the Scottish Rite has placed on its website a growing library of old Masonic books in pdf form. This is an incredible resource collected in one place. Visit the site here for descriptions of each one and the download links. - A Defense of Masonry, A. F. A. Woodford, 91 pages, 1874. - An Exposition of the Mysteries or Religious Dogmas and Customs of Egyptians, Pythagoreans and Druids (with a inquiry into the origin and history of Freemasonry), John Fellows, 433 pages, 1835. - Arcana Saitica, briefly discussed in three essays on the Masonic Tracing Boards, Amoy, 60 pages, 1879. - The Symbol of Glory, George Oliver, 316 pages, 1870. - Illustrations of Masonry, William Preston, George Oliver editor, 412 pages, 1867. - Francis Bacon and his Secret Society, Mrs. Henry Pott, 432 pages, 1891. - Legenda, (Kadosh and Heirodom), Albert Pike, 176 pages, no date. - Military Lodges, Robert Gould, 290 pages, 1899. - A Brief History of the A. & A.S.R of Freemasonry, Edwin Sherman, 148 pages, 1890. - On the Origins of Freemasonry, Thomas Paine, 44 pages, 1810. - Volume two of An Encyclopedia of Freemasonry, Albert Mackey, 529 pages, 1916. - The Bibliography of the Writings of Albert Pike, William Boydon, 97 pages, 1921. - Freemasonry in America, prior to 1750, Melvin Johnson, 247 pages, 1916. - Freemasonry in England from 1567 to 1813, Leon Hyneman, 201 pages, 1877. - Freemasonry in the Holy Land, Robert Morris, 625 pages, 1872. - History of the Ancient and Honorable Fraternity of Free and Accepted Masons, multiple authors, 900 plus pages, 1892. - The Secret Teachings of All Ages, Manly Hall, 633 pages, 1929 edition. - Mystic Masonry, J. D. Buck, 309 pages, 1897. - The American Quarterly Review, Albert Mackey editor, 585 pages, 1858. - The Craftsmen and Freemason Guide, Cornelius Moore, 323 pages, 1858. - The Four Old Lodges, Robert Gould, 101 pages, 1879. - The Freemason's Treasury, George Oliver, 407 pages, 1863. 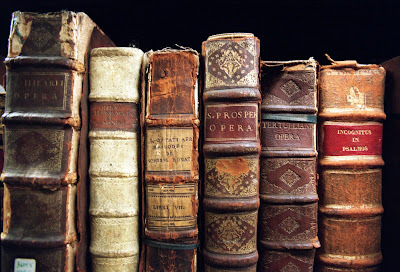 - The Freemason's Library and General Ahiman Rezon, Samuel Cole, 467 pages, 1817. - The Freemason's Monthly Magazine, Charles Moore, editor, volume 21, 796 pages, 1862. - The Historical Landmarks, George Oliver, volume one, 465 pages, 1867. - A Star in the West, George Oliver, 205 pages, 1825. - Lectures on the Philosophy of Freemasonry, Roscoe Pound, 113 pages, 1915. - The Mystic Tie, Albert Mackey, 271 pages, 1867. - The Life Story of Albert Pike, Fred Allsopp, 1920, 159 pages. - The Book of Words, Albert Pike, 177 pages, unclear date. - Cagliostro's Egyptian Rite, 51 pages, handwritten notes, unknown date. - J.S.M. Ward's three books: The Entered Apprentice's Handbook, The Fellow Craft Handbook and The Master Mason's Handbook, 29, 23 & 32 pages, unknown date. 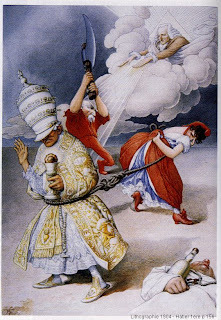 French Freemasons vs. The Pope. Again. While one group of Masons keeps arguing that there's no conflict between Freemasonry and Catholicism, another group steps in to stir the pot and prove otherwise. During his recent African trip, Pope Benedict XVI expressed his opinion that condoms were not the best means of AIDS prevention, preferring the teaching of abstinence. Doctrinally for Roman Catholicism, a proper stance I suppose, but one that calls to mind a metaphor about escaped horses and the pointless gesture of closing barn doors after they're gone. Still, not exactly what U.S. Masons would say was in their purview. But not so in France. These Masonic Obediences signatories express their amazement and outrage at the irresponsible position held by Pope Benedict XVI against the use of condoms as a means of AIDS prevention. On the occasion of his first trip in Africa, Benedict XVI cannot ignore the particularly tragic devastation that this disease brings the peoples of this continent, especially among children, and are systematically raised by the WHO, UN - AIDS and all NGOs in this field. A fair position, and one I don't disagree with. But most regular, recognized Masonic organizations would never presume to make such a public pronouncement. The Grand Orient of France, on the other hand, frequently takes public and well publicized positions on government and religious topics. France is a Catholic country, and I'd venture a guess that a substantial percentage of the Grand Orient's members are Catholics. But the GOofF is no stranger to being on the opposite side of the Vatican's views. The Grand Orient of France touts itself as being more open minded than other French grand lodges, allowing atheists to join their lodges. Yet, taking this sort of stance gets between its members and their own private beliefs. All of which begs the question: what the hell is their fraternity doing getting involved in political and religious matters? If the United Grand Lodge of England or a US grand lodge tried making such statements, the members would run the Grand Master out of town. Regular, recognized Masons forbid mixing religion, politics and Freemasonry for a very good reason. Lodge Vitruvian's Master for 2009 Wbro. Ken Davis is off in the far flung climes of Iowa, and made a visit to Specialis Procer Lodge U.D. in Des Moines. Worshipful Master of Specialis Procer this year is old friend Timothy Bonney, who I first met when he was living here in Indiana. He was a part of the original Knights of the North group who cobbled together "Laudable Pursuit," and we're pretty proud of the Masonic work he's been involved with in Iowa. Read about Ken's visit here. Right Worshipful Brother Grady Adams, Grand Master of American-Canadian Grand Lodge of Germany, has passed away. Adams had just arrived in Bahrain, and as he was descending the plane's ramp, he was struck with an apparent heart attack. Efforts to revive him were unsuccessful. Please keep his wife Efli in your thoughts and prayers. The ACGL is actually a grand lodge that operates as part of the United Grand Lodges of Germany (VGLvD). Freemasonry throughout Germany's history has been riddled with schisms, rivalry and unusual development, both before world War II and after. Several rival grand lodges arose in the country after the war, and foreign grand lodges chartered lodges and Masonic clubs for the Allied troops and contractors who were there in large numbers to rebuild the country. In 1946, a British-chartered "Square and Compass Club" in Frankfort petitioned the Grand Lodge of Oregon to start a military lodge, and Oregon Military Lodge U.D. was established with 56 members. Grand Lodges of Connecticut, Rhode Island, Texas and others soon established their own lodges across Germany for their English-speaking brethren. The American-Canadian Provinical Grand Lodge was organized in 1962 as part of the United Grand Lodges of Germany, and today comprises 44 lodges in Germany, as well as the Middle East, where they operate while keeping a very low profile. The Evening Standard is reporting that a pub in East London was evacuated today by a bomb scare. Buildings were evacuated, a street was cordoned off and a bomb disposal team called in after workmen spotted a suspicious object. 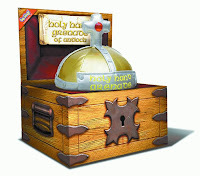 But the dangerous-looking weapon turned out to be the Holy Hand Grenade of Antioch, made famous in the 1975 film Monty Python And The Holy Grail. Police and a fire crew were first on the scene in Shoreditch, east London, when water company workers found a copy of the film prop under a fire hydrant cover. "There was no danger to the public. The device is believed to be an object known as a Holy Hand Grenade." ...And Saint Attila raised the hand grenade up on high, saying, "O Lord, bless this Thy hand grenade that with it Thou mayest blow Thine enemies to tiny bits, in Thy mercy." And the Lord did grin and the people did feast upon the lambs and sloths and carp and anchovies and orangutans and breakfast cereals, and fruit bats and large . . . And the Lord spake, saying, "First shalt thou take out the Holy Pin, then shalt thou count to three, no more, no less. Three shall be the number thou shalt count, and the number of the counting shall be three. Four shalt thou not count, neither count thou two, excepting that thou then proceed to three. Five is right out. Once the number three, being the third number, be reached, then lobbest thou thy Holy Hand Grenade of Antioch towards thy foe, who being naughty in my sight, shall snuff it." Amen. New York's two century old Independent Royal Arch Lodge No. 2, will hold their 19th annual Wendall Walker Lecture, on Thursday, March 19, at 7 pm, in the Second Floor Dining Room of the Masonic Hall, 6th Avenue and 23rd St. New York City. The guest lecturer is Mr. Damien Amblard, who will present "The Blood Stained Order:Anti-Freemasonry and the Evolution of American Politics." I came across a notice today that Deadwood, South Dakota has been celebrating St. Patrick's Day since Saturday, and that "The open container ordinance will be lifted from the Four Aces (bar) to the Masonic Temple." I can't think of a finer act of responsive local government. Terrance D. Olson's column this week in the LDS Church (Mormon) Meridian Magazine, Is Something Sacred? discusses his very personal experiences with people who did not worship as he did, but were tolerant of his beliefs. Please read the entire column, because I don't do it the proper justice by butchering it here. But I am posting excerpts below, because in many ways it also explains the philosophy of Freemasonry's openness to its members' private beliefs that accepts them without judgement (even though the article is not about Freemasonry). Such acceptance is not merely tolerance, but something greater. As the magazine's editor describes in his note, "This is an article that addresses the issue about the importance of granting to people what is sacred to them as a prerequisite for a civilized society." My experience has been that those who respect another's beliefs, especially beliefs about what is sacred, usually hold some things sacred themselves. To have reverence for something suggests an empathy for others who hold things sacred. Whatever we hold sacred, when we live true to those beliefs, we seem willing to grant others the opportunity to reverence their beliefs. When something is considered sacred, relationships among diverse peoples are possible. When nothing is held sacred, relationships, neighborhoods, cultures, and countries may be in conflict and possibly fall apart. Most of the time, it is probably our unwillingness to grant others their sacred feelings, and not the differences in what we hold sacred, that create contention. . .
Actually, it is possible to have sacred beliefs and yet demean other's convictions. To do so, however, means betraying our own beliefs of how to behave, perverting the attitudes we hold, or in other ways dishonoring our own spiritual commitments. Whether our betrayal takes the form of moral superiority, spiritual arrogance, interpersonal ridicule, or being offended at others' devoutness, all are signs of more than not granting others their sacred feelings. They reveal we have turned against our own. . . When nothing is sacred, everything is fair game in conflicts of ideas, attitudes, or behaviors. It was a great weekend in southwest Indiana on the banks of the Wabash, and the brethren of Vincennes Lodge No. 1 celebrated their rededication with absolute class. Check the article from the Vincennes Sun Commercial today. Saturday morning kicked off with a massive group photo at the county courthouse, followed by a most impressive parade to the lodge. Visitors came from Kentucky, Illinois, Texas, Alabama and Maryland for this occasion, and there were easily more than 200 in the lodge room on Saturday, with 130 at dinner Saturday night. One very unique aspect of the weekend. The Grand Master of Kentucky, Most Worshipful Brother Herman M. Forrester, reconstituted Vincennes Lodge No. 15 on Friday as a Kentucky lodge for 24 hours, until Indiana Grand Master Jeff Zaring took it back from them Saturday. Most Worshipful Brother Gus Stevens, Past Grand Master of Indiana and a member of Vincennes No. 1, gave a brief recounting of the founding of the lodge, and the visionary men who were at its beginnings. They were heroes of the Battle of Tippecanoe, founders of Vincennes University (Indiana's oldest college), business leaders, political leaders, and men for whom surrounding counties have been named. WBro. Brent Morris spoke at the lodge ceremony, explaining what was going on in the Masonic world at the time Vincennes Lodge was forming. He returned to address us at dinner last night on the subject of the major developmental stages of Freemasonry in the US (punctuating the evening's presentation with some rope and card slight of hand). Vincennes Lodge No. 1 has set the bar very high in staging this event. Congratulations again to the Master and brethren of the lodge (and a special nod again to Chris and Toni Kimmel for their tireless planning and work). Vincennes Lodge No. 1, Free & Accepted Masons, in Vincennes, Indiana celebrates its 200th anniversary today. Best wishes to WBro Johnny Edwards, his officers and the brethren of Vincennes Lodge as they enter their third century. I am honored to play a tiny role in Saturday's festivities by marching as part of Raper Commandery No. 1, Knights Templar in the parade. And a very special recognition is due to WBro. Chris Kimmel and his wife Toni for all they have done to help organize this tremendous celebration. The keynote speaker at the Bicentennial Ball will be S. Brent Morris, 33°, Grand Cross, Managing Editor of the Scottish Rite Journal. He retired after 25 years as a mathematician with the federal government and has taught at Duke, Johns Hopkins, and George Washington Universities. He is a Past Master of Patmos Lodge No. 70, Ellicott City, Maryland, Master of Quatuor Coronati Lodge No. 2076, London, a life member and Mackey Scholar of the Scottish Rite Research Society, a Fellow of the Philalethes Society, a Founding Fellow of The Masonic Society, founding Editor of Heredom, the transactions of the Scottish Rite Research Society, and Grand Abbot of the Society of Blue Friars. He is author of many articles on Freemasonry and the books, •Complete Idiot’s Guide to Freemasonry, •Masonic Philanthropies: A Tradition of Caring, •Cornerstones of Freedom: A Masonic Tradition, and others. He and Arturo de Hoyos co-authored •Committed to the Flames: The History and Rituals of a Secret Masonic Rite, •Is It True What They Say About Freemasonry? and co-edited •Freemasonry in Context: History, Ritual, and Controversy. 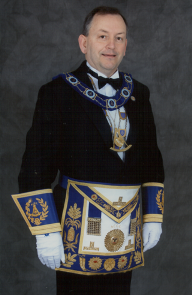 He is co-editor of •Freemasonry on Both Sides of the Atlantic. He is also a member of the Shrine, York Rite, the Red Cross of Constantine, the Royal Order of Scotland, and the Allied Masonic Degrees. From Masonic records we learn that Masonry came to Indiana Territory, which is now the states of Indiana, Illinois, Missouri, Wisconsin and Michigan, by way of our sister state, Kentucky. To Vincennes Lodge No. 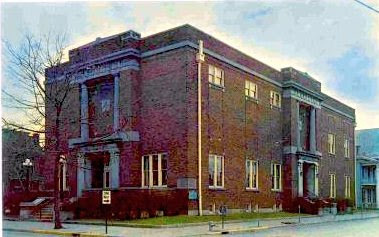 1, F. & A.M.,was given the honor of being the oldest Masonic Lodge in continual existance in the Indiana Territory. As early as 1807, local Masons wanted to form a Lodge in Vincennes and did petition the Grand Lodge of Kentucky for a Dispensation. In January 1808 the requested dispensation was granted, but circumstances prevented completion of the organization, and the dispensation expired. The Grand Lodge of Kentucky issued a second dispensation in September of 1808, and on March 13, 1809, Brother Jonathon Taylor, Past Master of Abraham's Lodge No. 8, of Louisville, Kentucky, installed the officers and set the craft to work. The officers installed were William Jones, WM, John Caldwell, SW, and General Washington Johnston, JW. On September 7, 1809, the lodge was regularly constituted as Vincennes Lodge No. 15, F. & A.M. under a charter issued by the Grand Lodge of Kentucky. The First officers installed under the new charter were Brothers George Wallace, WM, William Jones, SW, General W. Johnston, JW, Parmenas Beckes, the Treasurer, John D. Hays, Secretary, Charles Smith, SD, Jonathon Bond, JD, Peter Jones, Steward, and Charles Fisher, Tyler. At a preliminary meeting held in Corydon on December 3, 1817, General W. Johnston as a representative of Vincennes Lodge No. 15, with representatives from the Lodges located at Salem, Madison, Vevay, Lawrenceburg, Charlestown, Rising Sun, Corydon, and Brookville, adopted the following resolution: "That it is expedient and advisable that a Grand Lodge should be at this time formed in the State of Indiana. Notice to be given to the Grand Master of Kentucky." The meeting for the permanent organization of the M.W. Grand Lodge of Indiana was held at Madison, Indiana, January 12,1818, at which time Brother Alexander Buckner was elected our first Most Worshipful Master. On January 13, 1818, Vincennes Lodge was designated No. 1, and Brother General W. Johnston was appointed to install Brother Elihu Stout as the first Worshipful Master of Vincennes Lodge No. 1, F. & A.M.
General W. Johnston was the most distinguished member of this lodge and it was through his personal efforts that Freemasonry was brought into Indiana Territory. In the state, Brother Johnston was a man of prominence and took an active part in the formation of State and Territorial Government. It is said the few men, if any, did more to promote useful legislation to start the wheels of State Government moving in the right direction than he. A study by researchers Barry A. Kosmin and Ariela Keysar for Trinity College in Hartford, CT has yielded some new trends in self-reported religious beliefs and practices in the US. The American Religious Identification Survey 2008 (ARIS) was conducted last year, and is the third such study conducted by Trinity (the others were in 1990 and 2001). The studies are conducted in the lower 48 states, and this one questioned 54,461 adults on how they identified their own religious beliefs. Americans claiming no religion has gone from 8.2% in 1990, to 14.2% in 2001, and now 15% in 2008. US population has risen from 207 million to 228 million since the last census was taken, so that small rise actually translates into an additional 4.7 million who say "none." From a regional standpoint, Northern New England has now taken over from the Pacific Northwest as the least religious section of the country, with Vermont, at 34 percent "Nones," leading all other states by a full 9 points. Catholics remain the largest religious group nationwide, with 57 million people saying they belong to the Church. Catholicism has gained 11 million followers since 1990, but its share of the population fell by about a percentage point to 25 percent. Catholics make up a third of the adult population in California and Texas, and a fourth of Florida, primarily due to Latino immigrants. Baptists are the second largest Christian denomination. Most of the growth in the Christian population occurred among those who would identify only as "Christian," "Evangelical/Born Again," or "non-denominational Christian." The last of these, associated with the growth of megachurches, has increased from less than 200,000 in 1990 to 2.5 million in 2001 to over 8 million today. These groups grew from 5 percent of the population in 1990 to 8.5 percent in 2001 to 11.8 percent in 2008. Significantly, 38.6 percent of mainline Protestants now also identify themselves as evangelical or born again. "It looks like the two-party system of American Protestantism--mainline versus evangelical--is collapsing," said Mark Silk, director of the Public Values Program. "A generic form of evangelicalism is emerging as the normative form of non-Catholic Christianity in the United State s."
• Baptists, who constitute the largest non-Catholic Christian tradition, have increased their numbers by two million since 2001, but continue to decline as a proportion of the population. • Mormons have increased in numbers enough to hold their own proportionally, at 1.4 percent of the population. • Only 1.6 percent of Americans call themselves atheist or agnostic. But based on stated beliefs, 12 percent are atheist (no God) or agnostic (unsure), while 12 percent more are deistic (believe in a higher power but not a personal God). The number of outright atheists has nearly doubled since 2001, from 900 thousand to 1.6 million. Twenty-seven percent of Americans do not expect a religious funeral at their death. • Adherents of New Religious movements, including Wiccans and self-described pagans, have grown faster this decade than in the 1990s. Researchers plan a broader survey on Jews who consider themselves culturally Jewish but aren't religiously observant, as that percentage increases at a rapid rate. Chart from the Associated Press article here. When Jay sent me the flyer for this event, the logo showing the Unisphere sculpture reminded me that I haven't been to Queens, New York since 1964, when I attended the New York World's Fair. Thinking about the Fair always gets me misty-eyed. It was a different time and place, when it wasn't maudlin to look to the future with excitement and wonder, and the Fair was the biggest place I'd ever seen at the ripe age of five and a half. The Freemasons of New York had great ambitions, too. They erected a pavilion to tell the story of Freemasonry to the millions who came to the Fair. "The Masonic Center showcased Masonic history and memorabilia going back to medieval times. The Center, which stood across a reflecting pool from a 50-foot high model of the builder's square and compass, symbols of the fraternity, was sponsored by the Grand Lodge of New York. It included a hall for exhibitions, a lounge, office and outside patio. Dominating the hall was an 11-foot high statue, in Masonic regalia, of George Washington, first of 14 American Presidents (till 1964) who belonged to the brotherhood. Events from his life were portrayed in three-diminsional scenes, and the Bible on which he took the oath of office as President was on display. Documents on view dated back to the 14th Century, when the Masons were the cathedral builders of Europe. Among them was a Plan of Union for the colonies written by Mason Benjamin Franklin in 1754." The three-dimensional scenes discussed above were two diaramas, one depicting General Washington and General Lafayette (both Masons) at Valley Forge; the other showed Washington taking his oath of office in Federal Hall, New York City, as first President of the United States. Also shown was his apron as Master of Alexandria Lodge (Alexandria, Va.), a tuft of Washington's hair, and the Square and Compass which he personally used in laying out the lands of Fairfax County,Va. There were also displays about Governor DeWitt Clinton, Governor and Grand Master of New York; Lewis and Clark;Admiral Byrd; General "Blackjack: Pershing; Will Rogers; and other distinguished Masons in history. A map of the world showing the location of all 112 recognized Grand Lodges was displayed. 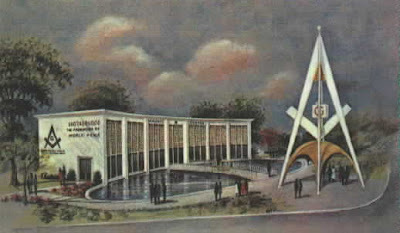 The theme of the entire pavilion was "Brotherhood, the Foundation of World Peace." Greg and Dean over at MasonicCentral.com continue to bring notable Masonic authors and researchers to their podcast program. Tonight, Sunday March 8th, they will be speaking with Brother W. Kirk MacNulty about his books "Freemasonry: Symbols, Secrets, Significance" and "Freemasonry: A Journey Through Ritual and Symbol". I've had the distinct pleasure of meeting him a couple times, as well as hearing him speak, and Brother MacNulty always gives you a new perspective to ponder about the fraternity, its symbols, origins and philosophy. The show records live at 9pm EST/6pm PST on MasonicCentral.com, and you can also access previous programs. Next week, March 15, UCLA history professor Margaret C. Jacob, author of "Living The Enlightenment" will be the featured guest. Greg Stewart has also revamped his website at www.freemasoninformation.com with an ambitious lineup of blogging partners collected together in one place. The Honolulu Advertiser has a refreshing article today about Ko'olau Masonic Lodge on the island of Oahu. 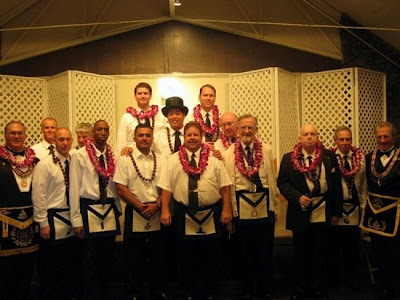 The Ko'olau lodge has been serving the windward side of Oahu and is made up of Freemasons living on this side of the island. 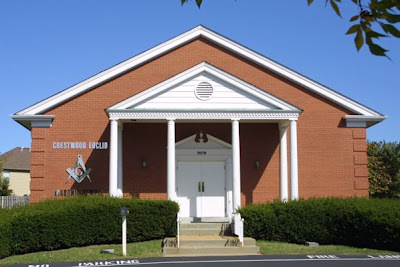 Most Worshipful Donald Wilson states, "It is interesting to see that the membership is made up of younger men ever seen in a fraternal organization and that the restructuring and rebuilding of the lodge is growing each year. To see freemasonry increasing in numbers, especially in the younger men, thrills my heart and allows me to see a beacon of hope for the fraternity which in previous years has shown a decline". New Book: "The American Fraternal Sword"
Remember in National Treasure when young Benjamin Gates finds grandpa's Knight Templar sword in the attic? That scene gets repeated in real life every day in dozens of attics and basements. They can be from the Masonic Knights Templar, the Knights of Pythias, the Catholic Knights of Columbus, the Grand Army of the Republic, or a bumper crop of other fraternal groups who jumped on the drill team bandwagon after the Civil War. When the war ended, the military uniform and sword suppliers went looking for new business, and like Harold Hill selling band uniforms in The Music Man, they created a craze for marching and sword drilling in parades. Men returning home from the war sought the camaraderie and the trappings of military life (made far more enjoyable by not having people shooting at them anymore, and knowing they could go home at the end of the day). Thus, the fraternal sword came to be a treasured possession for literally hundreds of thousands of men across the US, from the 1860s up through today (albeit in much smaller numbers these days). Some were plain, some were ornate, but all were the symbol of a modern knighthood, and a tradition of honor and chivalry. A new book has just been published that will make identifying that long hidden fraternal sword simpler. The American Fraternal Sword: An Illustrated Reference Guide by John D. Hamilton, Joseph Marino and James Kaplan. According to the website, it contains more than 900 color photos, showing almost 600 different swords, arranged by organization, with a directory of manufacturers, organizations and their insignia. Pricey at $79.99, but absolutely invaluable for collectors, dealers, and your Templar commandery. John D. Hamilton was the curator at the Scottish Rite's National Heritage Museum in Lexington, Massachusetts for many years, and he is the author of "Material Culture of the American Freemasons." Thanks to Mark Tabbert for the heads up on this. Looking For A Festive Board Location? The Heart Attack Grill! The perfect location for your next Festive Board! The Heart Attack Grill in Chandler, Arizona. Happy Independence Day to the brethren of Texas. Today marks their declaration of independence from Mexico and the beginnings of the Republic of Texas. The declaration was formally read on March 2, 1836 in the little town of Washington. The Battle of the Alamo would start four days later, and last 13 days. The nearly 200 defenders who died at the Alamo at the hands of Mexican president-general Santa Ana included Freemasons James Bowie, David Crockett, James Bonham, William Barrett Travis, and Almaron Dickenson. It's not known whether Santa Ana himself truly was a Mason. As president, he outlawed the practice of Freemasonry in Mexico, as most dictators do. And at the Alamo, he ordered the bodies of Masons to be hacked into bits. Yet, the story has long been told that, after his capture at the battle of San Jacinto, he prevented his execution at least twice by 'filling the air' with Masonic signs and giving the Masonic grip to Sam Houston. That's the story, anyway. The Grand Lodge of the Republic of Texas was formed April 16, 1838. The Republic of Texas itself lasted less than a decade, when it became a state on December 29, 1845. 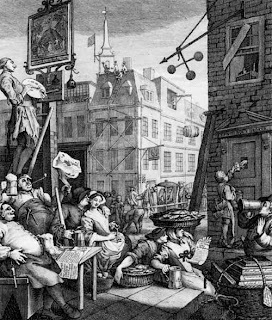 An invitational Masonic body officially known as the Worshipful Society of Free Masons, Rough Masons, Wallers, Slaters, Paviors, Plaisterers and Bricklayers, or more colloquially as "The Operatives," was constituted back on November 29th, 2008. This chapter is the Bryn Athen Quarry Assemblage, in Allentown, Pennsylvania. This is the first constituted assemblage in the United States. 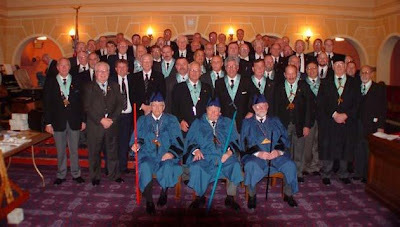 The Grand Assemblage is in England, and claims more than 2,000 members worldwide. According to The Operatives' Grand Assemblage website, "The Society exists to perpetuate or preserve a memorial of the practices of operative Free Masons existing prior to, or continuing independently of, modern speculative Freemasonry." A note posted on the Grand Assemblage's website from Glenson Jones, VII', Regional Clerk for the North America Region, says there are also two other groups in the USA working toward other Assemblages. For official information contact Worshipful Brother Matthew D. Dupee VI°, Deputy Master Mason. Back in the "old days" of Masonry, a full lodge was a common sight as Masonry was THE social event on any given evening. But few, if any, hands will be raised today when gentlemen of a lodge are asked "Who has ever sat in a regular communication with 100 men in attendance?" Our objective is simply to get 100 men together in a regular communication. This simple but unique act does so much to show us what Freemasonry looked like in the past and where it could go in the future. More importantly, how can the young men of the lodge know what the future will be if we have not experienced and understood the past? Spread the word; tell your brothers far and wide. Close your eyes. Imagine such a meeting. Make it happen. Contact the lodge here for more information. The complete text is now available online of Benjamin Franklin's reprint of James Anderson's Constitutions of 1723. This was the first Masonic book known to have been published in the American colonies, printed in Philadelphia in 1734. Thanks to the National Heritage Museum's blog for the heads up. The Museum, owned by the Scottish Rite Northern Jurisdiction in Lexington, Massachusetts, has an original copy of the book. And, of course, thanks to the University of Nebraska for making the book available online. Pardon a shameless bit of capitalistic promotion, but it's one that ultimately helps you. March is officially "Dummies Month," and the good folks at Wiley Publishing have a regular program every year at this time. Buy a Dummies book or audio set and get a $5 rebate (up to two per family). That means you can buy one or two Dummies books on any subject (not just ours) between March 1st - 31st, 2009, and get $5 smackers each delivered to your majestic manse's mailbox direct from the publisher. In addition, the Wiley folks will also send along another $5 mail-in rebate form for any Dummies book purchased in June, July or August 2009.